First-of-its-kind Steal The Look app helps women nab any look they love–from a high-fashion magazine to a friend. Broadcast commercial filmed in L.A. and directed by world-renowned creative visionary David LaChapelle. Activation at the iHeartRadio Music Festival in Las Vegas September 19 and 20. For the first time in the brand’s 35-year history, wet n wild® (www.wnwbeauty.com) launches an edgy, audacious and brassy new campaign this week called “Steal The Look.” Based on the insight that women look to makeup for transformation, empowerment and play, the brand known for its criminally large number of colors is set to help women lift any look they love–from a high-fashion cover model to a friend down the block–and re-create it for less. Available for free, the iPhone- and Android-compatible app helps women nab any look they dare to wear in just a few simple swipes (see steps below). 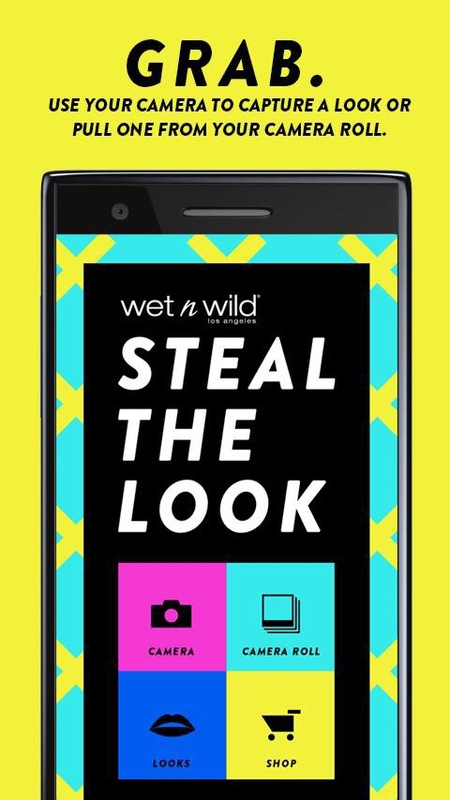 The “Steal The Look” app will tell her which wet n wild products to use to re-create the look without spending a pretty penny (all of wet n wild’s more than 300 products are $6 or less). Grab – Use your camera to capture a look or pull one from your camera roll. Tap – Select the lip and eye colors you’d like to steal from the look. Pick – Choose the skin tone that is closest to yours. Steal – Discover which wet n wild products you need to dupe the look. The “Steal The Look” commercial combines the revolutionary style LaChapelle is known for with the audacious personality of the wet n wild brand. Filmed entirely in L.A., the spot demonstrates the range of potential looks the brand is capable of helping women create–all through a colorful crime spree of women stealing other women’s look. The commercial makes its broadcast debut during the September 22 season premiere of NBC’s “The Voice” and includes a voiceover by Ashley DuBose, a 2013 contestant. To help bring the campaign to life, wet n wild will head to the iHeartRadio Music Festival in Las Vegas on September 19 and 20 as official festival sponsor. The brand will invite all guests in attendance to visit the “wet n wild Beauty Hideout,” located at the iHeartRadio Music Festival Village. Professional makeup artists will be on-site to demonstrate how the app works and create “Steal The Look” makeovers, while brand ambassadors hand out free wet n wild products. Celebrity guests Ellen K, Courtney Lopez and Courtney Bingham will be in the “Hideout” promoting the campaign. During the music festival, Fergie, award-winning artist and Global Beauty Ambassador for wet n wild, will take the stage to promote the campaign. During NBC’s premiere of “The Voice,” wet n wild will hold three viewing parties carried out in Los Angeles, New York, and Toronto simultaneously on September 22. The three events will introduce some of the industry’s top beauty bloggers, vloggers, makeup artists, style influencers, and celebrities to the “Steal the Look” campaign.